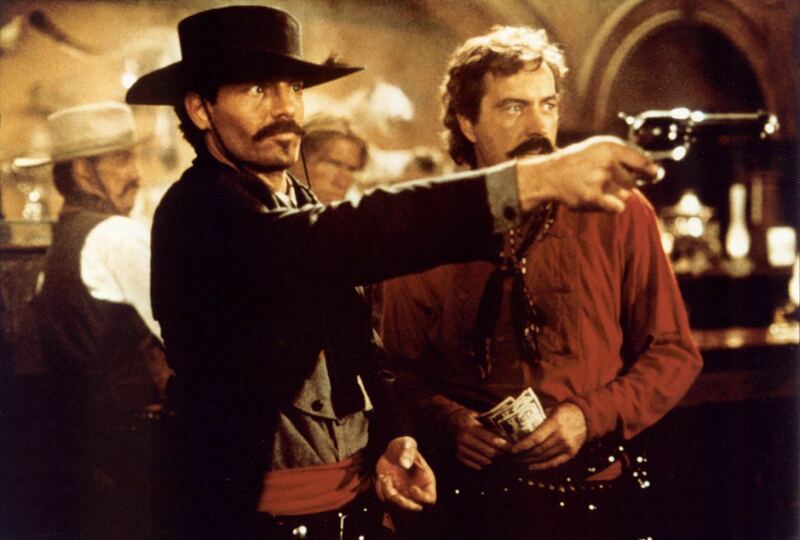 Tombstone is one of those movies that nobody talks about, but anytime you admit that you haven’t seen it, whoever you’re talking to is bound to violently react with a sharp gasp and a “what do you mean you haven’t seen Tombstone? !” like you just admitted that you’ve never eaten a hamburger in your life. Today, I fixed that problem. Watched Tombstone, that is. Anyone who looks at my midriff will know for a fact that I’ve eaten many, many hamburgers in my lifetime. Tombstone is an American western-action film based on the true story of Wyatt Earp (Kurt Russel), a retired wild west lawman who wants to settle down in Tombstone, Arizona, but is roped back into dishing out rifle-fueled justice with his brothers Virgil (Sam Elliot) and Morgan (Bill Paxton, R.I.P.) and an old friend and con-artist Doc Holliday (Val Kilmer). The Cowboys, a gang nearly one hundred strong has been terrorizing Tombstone and its surrounding area, and after a couple violent and bloody run-ins with the gang and it’s leaders Curly Bill (Powers Boothe) and Johnny Ringo (Michael Biehn), the Earp brothers and Doc don law badges and set out to clean up Tombstone once and for all. Also, if you’re marveling at how all-star this cast is, let me inform you that Charlton Heston, Stephen Lang, Jason Priestley, and Paula Malcomson are also in it. 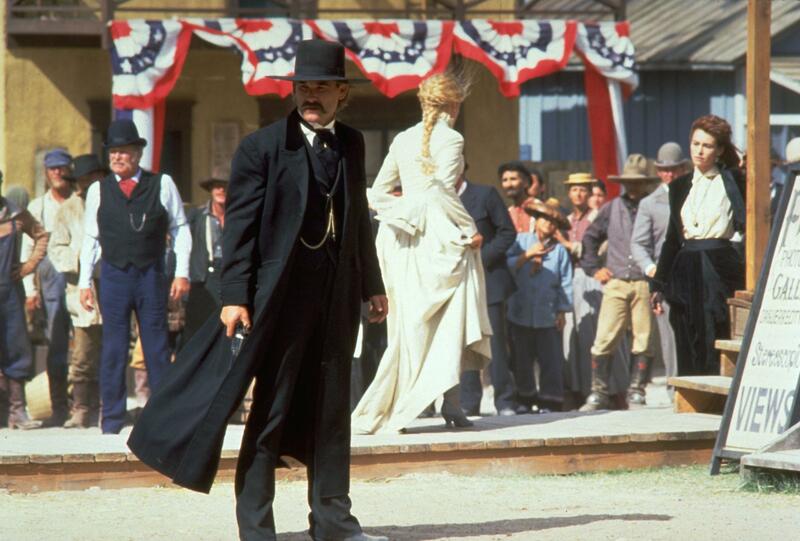 Tombstone is often cited as one of the manliest movies ever made, and for good reason. I’m talking outdated, old school manliness, here. Kind of a blend of Predator’s sweaty, muscled, mustachioed machismo and Locke’s moral, men-must-do-the-right-thing-and-face-the-consequences-of-their-actions manliness. Don’t worry, there are gunfights aplenty, with people getting riddled full of bullet holes and blood spilling out into Tombstone’s dusty streets. Wyatt and his brothers are faced with a multitude of moral issues, from the murky waters of frontier justice to the awkward navigation of falling in love while already married. The more I see Kurt Russel in movies, the more I totally fall in love with him. He totally carries his usual gruff, intimidating persona, but he’s able to provide enough depth and carry a convincing enough rounded character to help keep you invested throughout the whole film. The other Earp brothers are just as charismatic and command the screen as much as Wyatt which is important, because when the lead starts flying and bodies start dropping, you hope to God that the Earp’s stay standing. The violence in Tombstone is spread out, and built up to in large set pieces, traditional to a western action movie of the ’80s or ’90s. This film doesn’t feel like a spaghetti western with vast expanses, exploration and adventure, as most of the running time takes place within the city limits of Tombstone. The city itself offers a lot of neat environments for our large host of characters– a lot more than I was expecting. We’ve got the wide open streets of the city which make the perfect stage for a pistol duel or for a gang on horseback to storm straight through, The Oriental, a fancy, high-end bar that’s been subject to residency from the Cowboys, or the muddy riverbanks on the outskirt of town where one of the final shootouts take place. Tombstone doesn’t feel static, despite its small scale story. The one thing Tombstone does borrow from the spaghetti westerns of yore is grit. Grime. Dirt. Tombstone is a brutal, down and dirty movie. When people get shot, they die. After a fight, characters look roughed up, covered in blood and sweat. Oh man, the sweat. You can feel the heavy southern heat cooking these poor folk alive during the movie. Layers of sweat are caked on to everybody’s faces with bits of dirt filling in each pore. Characters sustain injuries that matter and last throughout the film. Grown men ache from the trauma they experience by simply walking the streets of Tombstone, Arizona. I want to take a moment to mention Val Kilmer as Doc Holliday. I’m not a huge Val Kilmer fan. I haven’t taken really taken a liking or an interest to any of his films except Kiss Kiss Bang Bang, and even then, he was pretty much my least favorite part. Whenever he’s on screen, the movie feels instantly dated. I guess he hit his stride and became an icon in the ’90s and early 2000s, but now whenever I see him in something, it always feels fifteen to twenty years old, regardless of its actual release date. That being said, Val Kilmer isn’t bad in Tombstone, but he isn’t good either. Kilmer ratchets up the campiness for his portrayal of Doc Holliday, drinking and smoking his life away while coughing up a lung from tuberculosis while also being a smarmy, silver-tongued thief and master gunslinger. In short, Val Kilmer is hungry, and whenever he’s on screen he’s busy devouring the scenery. His accent and mannerisms remind me (and definitely influenced) Leonardo DiCaprio’s Calvin Candie from 2012’s Django Unchained, except with more blood erupting from his face.